A lot of people were not able to even make it to a safe area during the tornadoes this morning. I hope the following information regarding a new weather alert technology, called "WRSAME ", will make this happen less. Please prepare for disasters. We are going to have more of them and worse ones for the rest of your life. If you want a decent chance of survival, you need to prepare for disasters. Have a NOAA Weather Radio with a warning alarm tone and battery back-up to receive warnings quickly and directly from your local National Weather Service office. A new technology called WRSAME allows you to set such weather radios to alarm for your county and surrounding counties; so look for the WRSAME feature when purchasing weather radio units. Listen to radio and television for information when severe weather is likely. Outlooks and watches from the Storm Prediction Center can also help you be aware of the possibility of severe weather during the day. Please find out whether your school leaders have read and acted on this information. If they have not, collect a committee of irate parents and sit on the school leaders and read the information aloud to them. Do not let them up until they promise to prepare their school adequately for disasters such as tornadoes. Your children may want to give them wedgies while you have their school leaders down anyway. You owe it to your children. The most important part of tornado safety in schools, and in similar logistical arrangements such as nursing homes, is to develop a good tornado safety plan tailored to your building design and ability to move people. I have found, through damage surveys and other visits, that a lot of schools settle for a cookbook-style, "one size fits all" approach to tornado safety -- often based on outdated literature -- which can be dangerous when considering the fact that every school is built differently. The basic concept in the schematic at right is usually correct; but it must be adapted to your unique school arrangements! For example, the idea of a relatively safe hallway becomes invalid if the hall is lined with plate glass, or if it has windows to the outdoors. BUILDING STRENGTH: Architecturally, how sound is the construction of the main building? What interior parts can stay intact during total structural loads created by 150-200 mph winds (which exceed the speeds found in most tornadoes) from any direction? Is anyplace on an upper floor safe enough in such structural stresses? To best answer that, consult a professional architectural engineer -- preferably one who has wind engineering experience. Sure, there are budgets to make; and such expertise won't come cheap -- but it can ultimately save lives. FEMA also has an online discussion on construction of community tornado shelters, including those for schools. Other valuable sources for help are your local emergency manager's office, and the Warning Coordination Meteorologist (WCM) at your nearest National Weather Service office. NEW CONSTRUCTION: Although this guide is intended for existing facilities, many of the same concepts can be applied to making tornado-safe schools from the blueprint stage. The same questions about wind damage and tornado safety should be asked of the architects and engineers. Again, this is where a licensed engineer with wind engineering specialization would be the most beneficial; and the FEMA tornado shelter guides are great resources too. Even if hiring a professional engineer isn't an option, the builder can line with concrete enough interior rooms in the school to create a series of safe rooms to hold students. Safe rooms aren't just for houses! They can also be retrofitted into existing facilities; but that is usually much costlier than building them in new construction. PORTABLE CLASSROOMS: These can be death traps. Portable classrooms are most often constructed like mobile homes; and they are just as dangerous. Any sound tornado safety plan must include getting students out of portable classrooms and into a safe area in the main building, as quickly as possible, to minimize the time spend outside and exposed to the elements. While the seconds spent outside will pose considerable risk, the danger inside the trailer is just as great. If feasible, students should be evacuated from portable classrooms before the storm threatens -- before the warning, when a tornado or severe thunderstorm watch is issued. Remember: Tornadoes can occur with little or no advance warning. Moving those students inside the main building for every SPC watch may be a hassle; but it may also save precious seconds and the lives of students if a tornado or extremely severe thunderstorm hits later. DANGER - GYMS and AUDITORIUMS: Large, open-span areas, such as gymnasiums, auditoriums and most lunchrooms, can be very dangerous even in weak tornadoes, and should not be used for sheltering people. This sort of room has inherent structural weaknesses with lack of roof support, making them especially prone to collapse with weaker wind loading than more compact areas of the same school building. 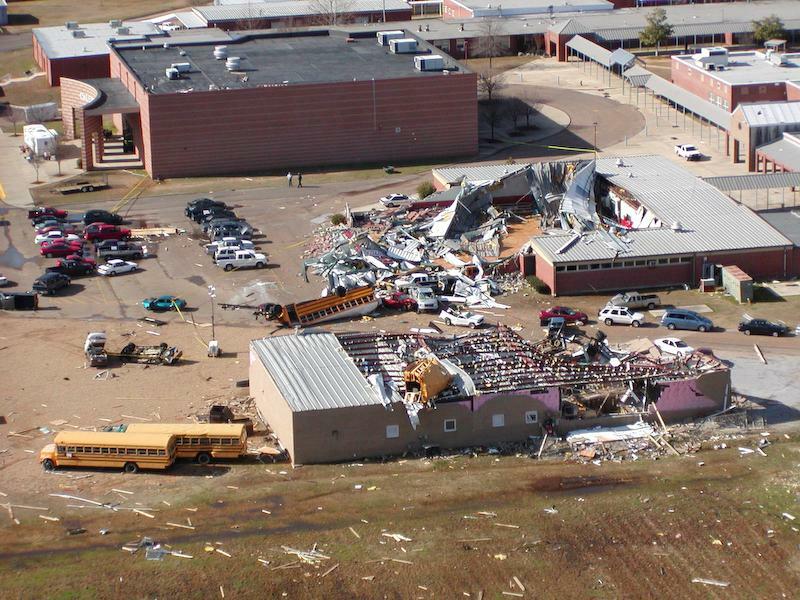 Consider the aerial photo of Caledonia (MS) High School (below) as an outstanding example of this, when the near side was hit by a tornado in January 2008. 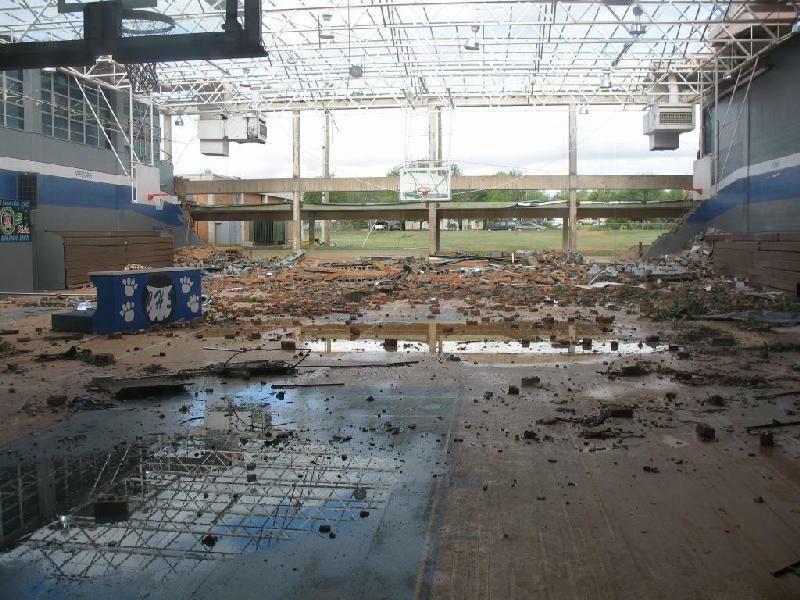 The next photo shows the inside of the Childress (TX) High School gym after a May 2006 tornado. The tornado was rated F1 (weak, on the original F-scale) at the school, although it did do F2 damage elsewhere. This further illustrates the hazard of indoor areas with large roof spans, even in "weak" tornadoes. If the school's alarm system relies on electricity, have a compressed air horn or megaphone to sound the alert in case of power failure. Make special provisions for disabled students and those in portable classrooms. Portable classrooms are like mobile homes -- exceptionally dangerous in a tornado. Make sure someone knows how to turn off electricity and gas in the event the school is damaged. Keep children at school beyond regular hours if threatening weather is expected; and inform parents of this policy. Children are safer deep within a school than in a bus or car. Students should not be sent home early if severe weather is approaching, because they may still be out on the roads when it hits. Lunches or assemblies in large rooms should be postponed if severe weather is approaching. As illustrated above, gymnasiums, cafeterias, and auditoriums offer no meaningful protection from tornado-strength winds. Also, even if there is no tornado, severe thunderstorms can generate winds strong enough to cause major damage. Know the county/parish in which your school sits, and keep a highway map nearby to follow storm movement from weather bulletins. Online maps and weather sources can be valuable, but if the power is out, it helps to have paper maps. Listen to radio and television for information when severe weather is likely. Outlooks and watches from the Storm Prediction Center can also help you be aware of the possibility of severe weather during the school day. Seconds count. Follow the drill according to the plan you have developed. Lead all students to the designated safe places in a calm, orderly and firm manner. Everyone should then crouch low, head down, protecting the back of the head with the arms. Stay away from windows and large open rooms like gyms and auditoriums. Keep students assembled in an orderly manner, in a safe area away from broken glass and other sharp debris, and away from power lines, puddles containing power lines, and emergency traffic areas. While waiting for emergency personnel to arrive, carefully render aid to those who are injured. Keep everyone out of damaged parts of the school; chunks of debris or even that whole section of the building may fall down. Ensure nobody is using matches or lighters, in case of leaking natural gas pipes or fuel tanks nearby. It is very important for teachers, principals and other adult authority figures to set a calm example for students at the disaster scene, and reassure those who are shaken. Remember, there is no such thing as guaranteed safety from a tornado. Freak accidents happen; and the most violent tornadoes can level and blow away all but the most intensely fortified structures. Extremely violent EF5 tornadoes are very rare, though; and even within one's path, only a small area has EF5 damage. Most of any tornado's damage track is actually much weaker and can be survived using sound safety practices. End of information from the Storm Prediction Center. You need to be prepared for disasters, and so do your children and their caregivers. Go forth and prepare. I have lists of preparedness supplies elsewhere on this blog. Some are from the Red Cross and CDC, etc. Get your information anywhere, just get prepared for disaster.